And the shows continue to surprise and delight! TRAINS! 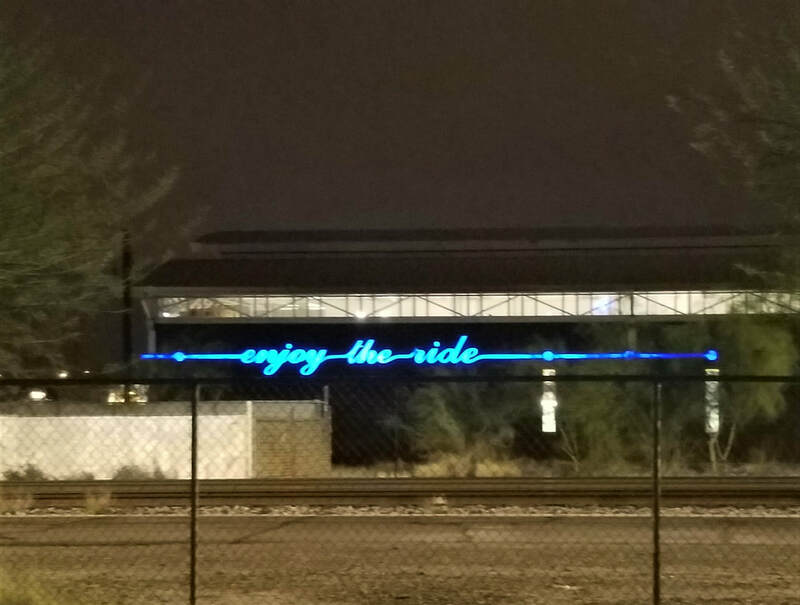 Unrelated to rocks, but still a fun part of Tucson are the trains that run so frequently here in the city, both with freight and with passengers. All day long, one hears the clickety-clack and the whistles of trains that traverse this city. 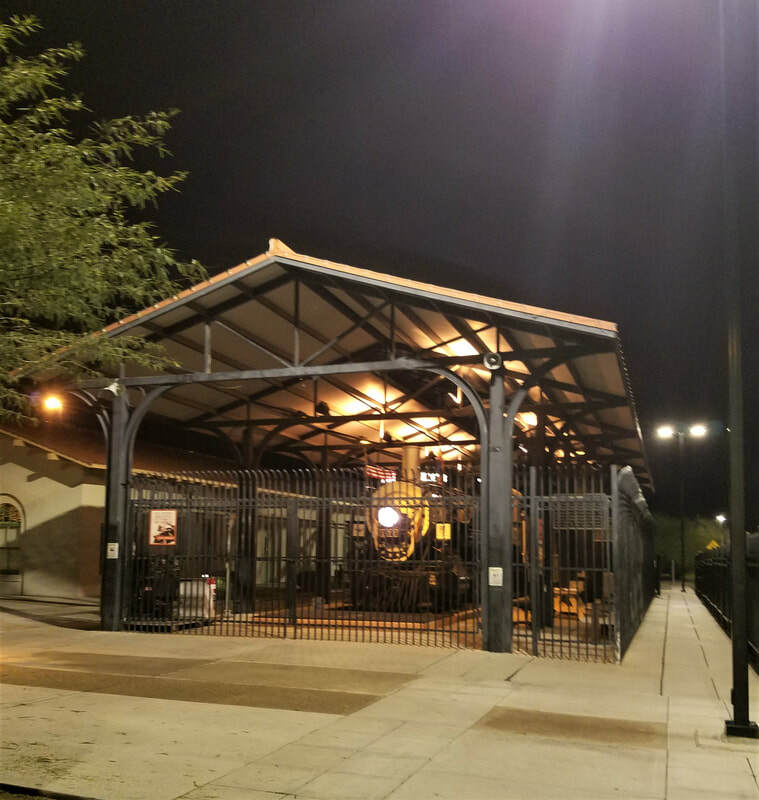 An extra treat at this Historic Depot is the fine French restaurant Maynard's Market and Kitchen, to which we were introduced many years ago by our late friend, Lewis Goodman. We miss getting together with him at this show, especially when we dine at Maynard's. 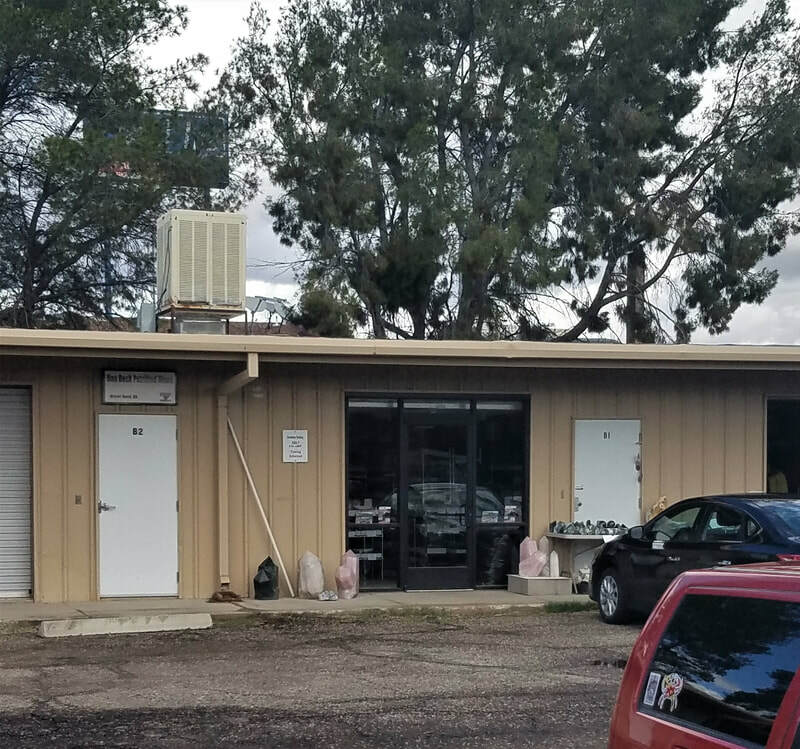 ​ Tucson Showplace -- a small cluster of industrial "condo" units, where we usually visit Dan Beck, a premier vendor of petrified wood. Dan is "under the weather" this year (as we say in the US), and was unable to make the trip to Tucson, so we checked out the agates. 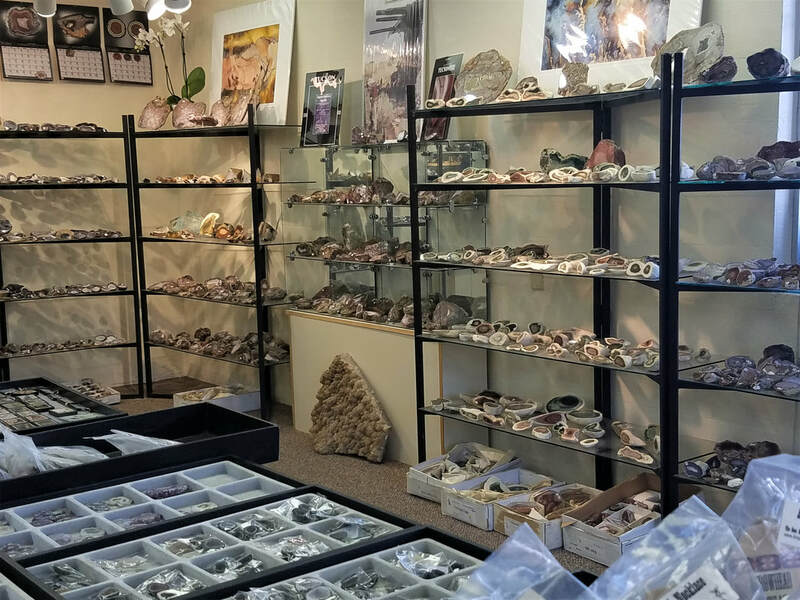 Gene Mueller of the Gem Shop (who began the Gem Shop in 1971 in Cedarburg, Wisconsin) provided us with many prime agates and rough at which to gawk. 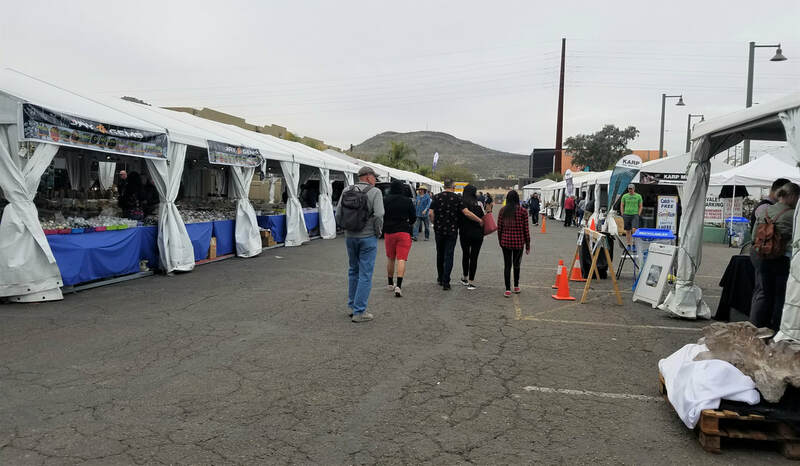 Smokey's Sixth Annual Miner's Coop-Rock Show is held at Mark Jacobs Sports Park in Marana, about 12 miles north of downtown Tucson. 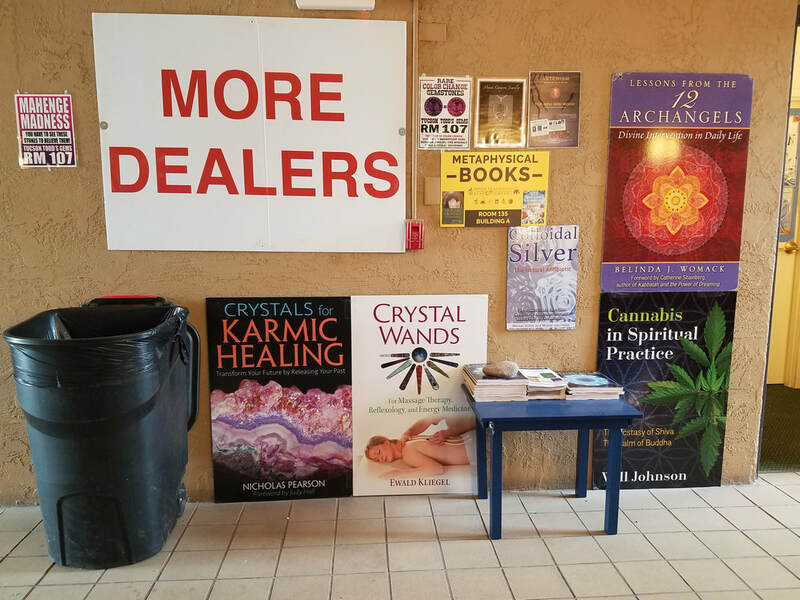 After the rains arrived a few days ago, and while the weather was still threatening, the dealers were open and ready to deal. 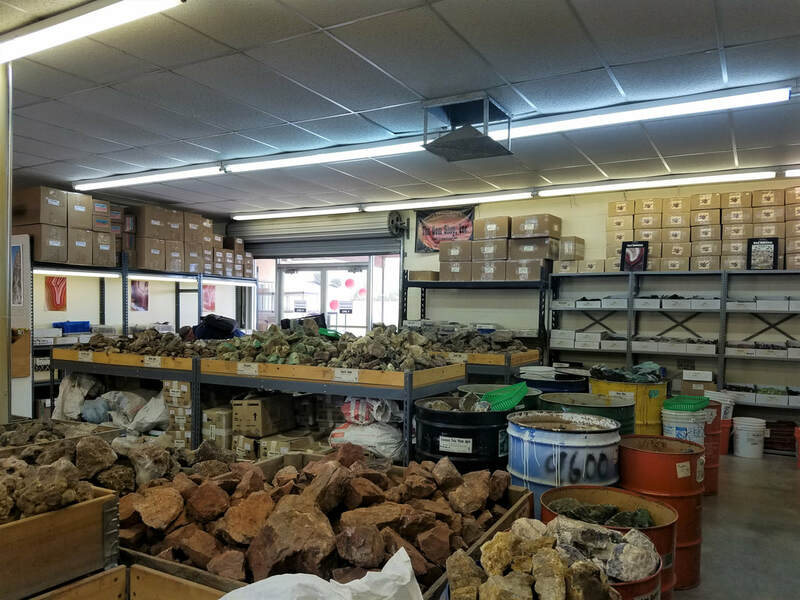 This is what we call an old-fashioned rock sale -- everyone is selling their material outside, and most are staying in their trailers or recreational vehicles just beside or behind their tables. 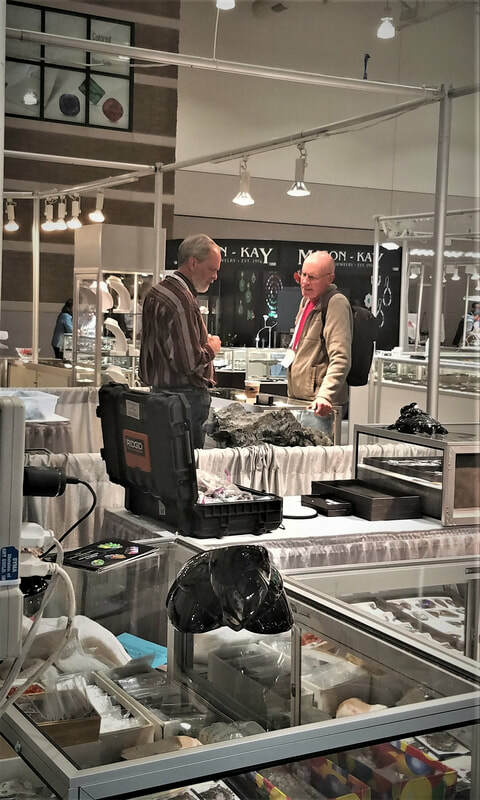 Wholesale and retail at this show. ​No extra charge for the constant din of freeway noise with the I-10 interstate only 150 feet away. These are some stalwart sellers! Back at the Hotel Tucson City Center, which as we said, cannot be visited in just one day, we discovered on the patio an artists' gallery. 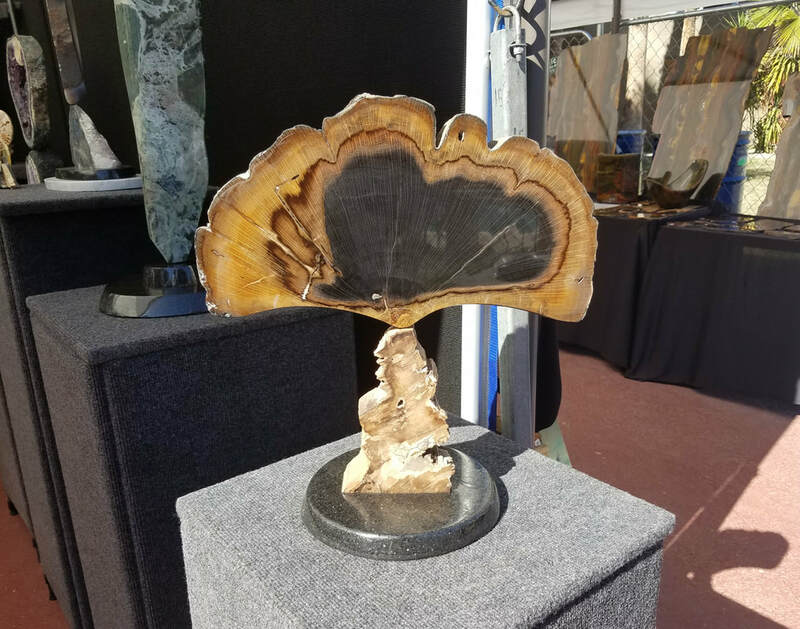 This particular artist had found a creative method to display a broken slab of Stinking Water oak. 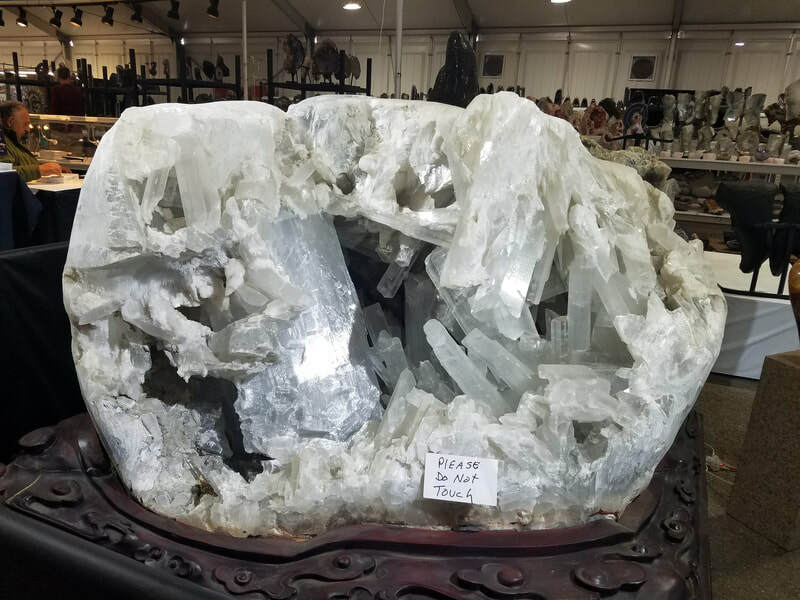 And in another well-respected dealer's room, we couldn't help but admire this complete cycad that one could take home for $28,000. ​Unusual (but not rare!) snow on the mountains around Tucson. 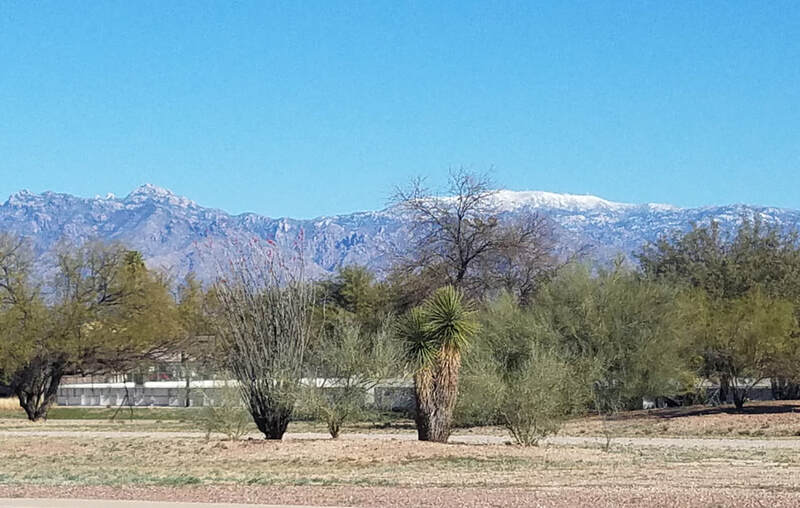 Mount Lemmon (9157 feet, 2791 m), the highest peak in the Santa Catalina Mountains to the north of Tucson, has a dusting of snow -- proving once and for all that winter desert weather in the Sonoran Desert is anything but predictably mild! 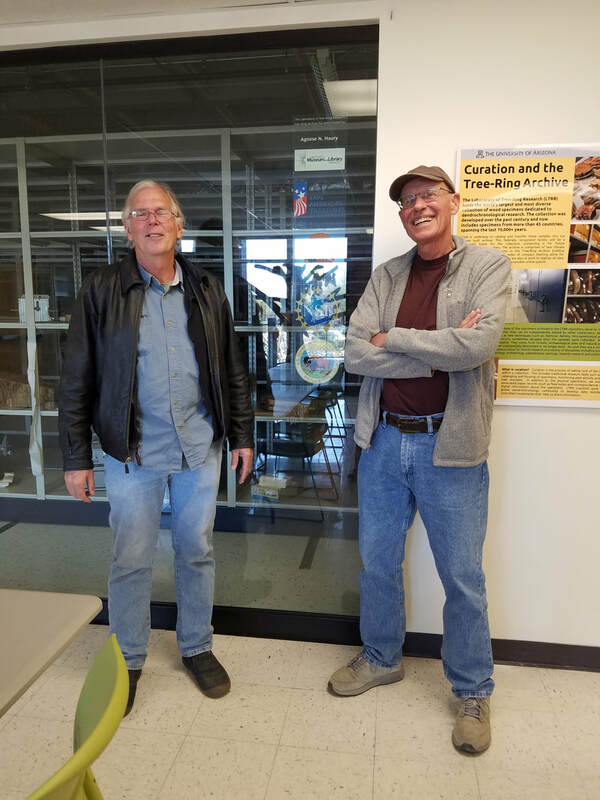 A library of tree rings: Our annual visit with Chris Baisan (shown with Jim, left) and Ed Wright at the University of Arizona Laboratory of Tree Ring Research is always a learning experience! 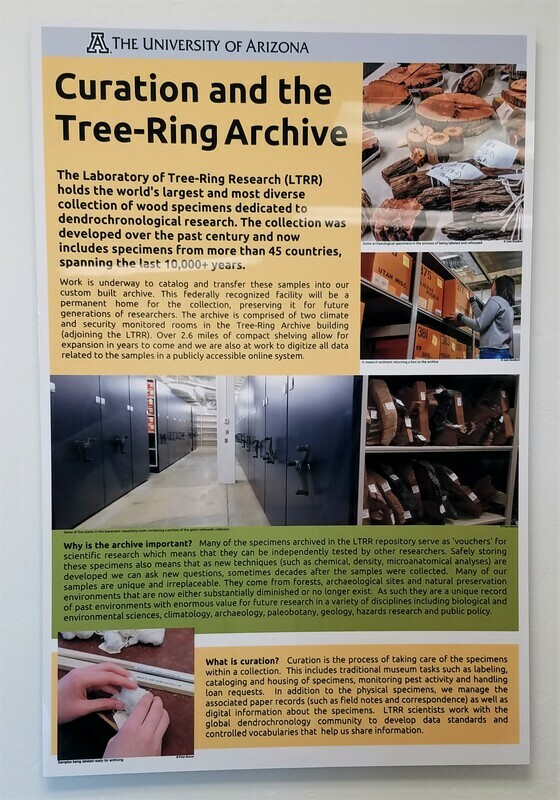 Their dendrochronology research is so multi-faceted that it is hard to say where that research will lead in the fields of climate change, forest decline, palebotany, hazards research, and biology. 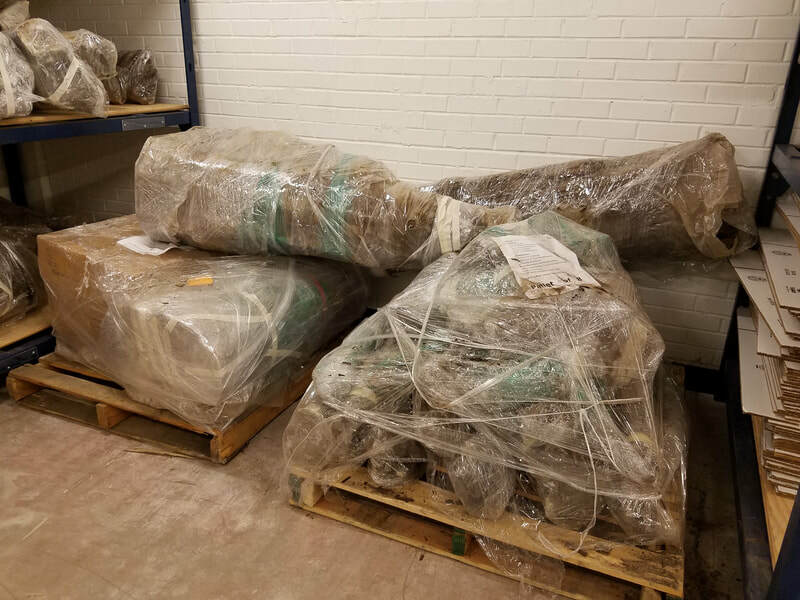 Their samples come from archaeological sites, forests, and naturally preserved areas -- and those samples will provide a unique record in areas that we cannot imagine, even today. The collection is immense and growing. It's always fascinating to talk with Chris and Ed -- and to learn where their latest research (and the dollars so necessary to that research) is leading. This institution has been active for almost 100 years -- and its purpose is that much more important all these years later. 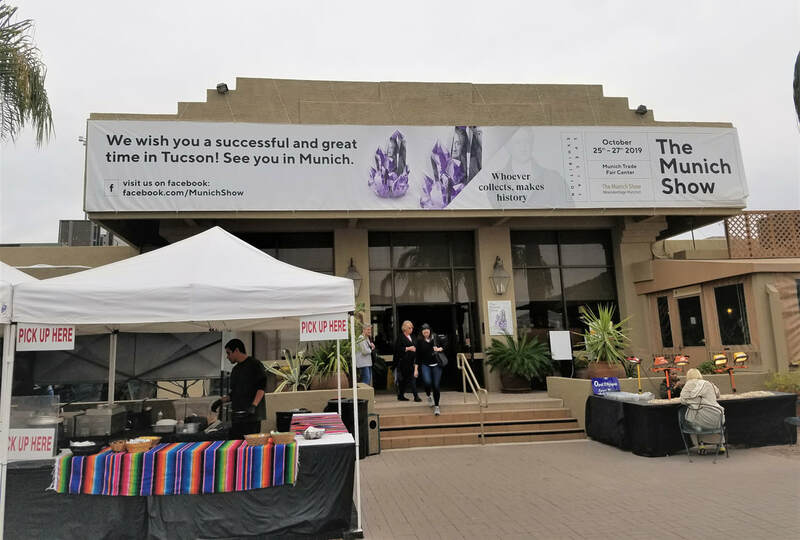 ​ The American Gem Trade Association sponsors one of their annual GemFairs at the Tucson Convention Center for 5 days each winter. (They sponsor another in Las Vegas each year.) 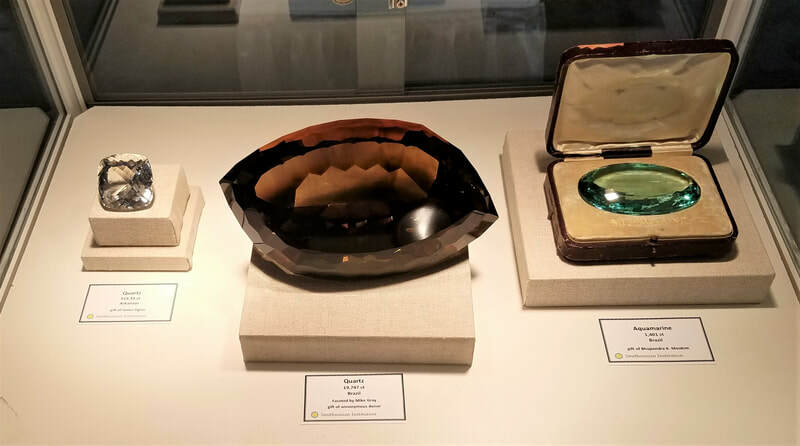 This premier show for jewelers is "wholesale only" with credentials and security strictly enforced. 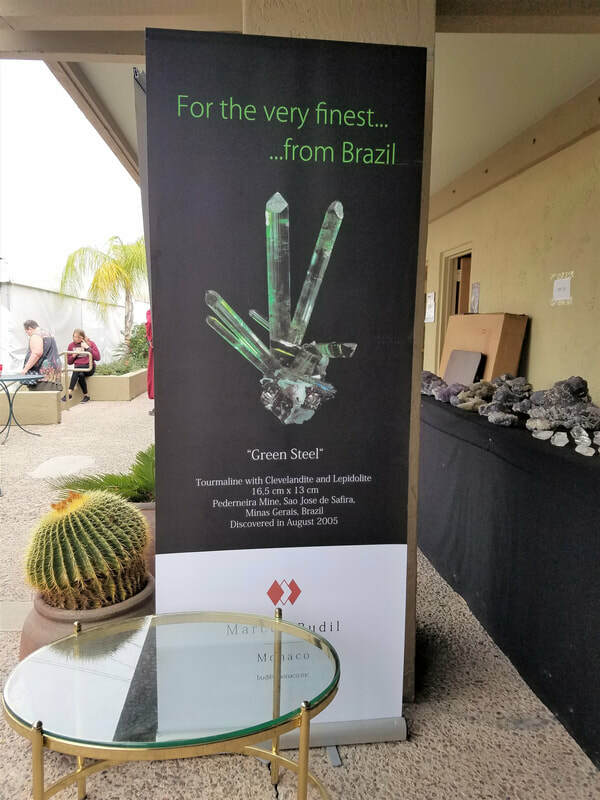 Faceted stones, gem carvings, and jewelry are the focus -- but we found one dealer selling rough Washington jade. 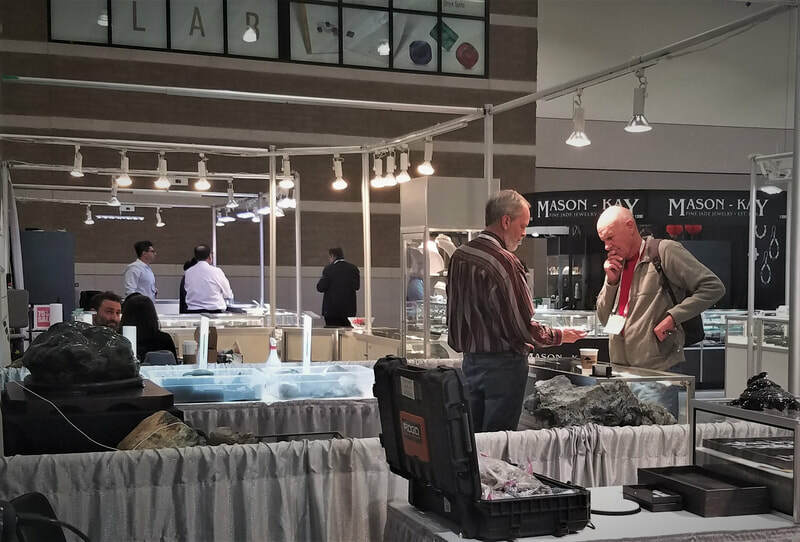 We wonder how well they did at a show that is geared to faceted stone buyers, and whether they will be at this venue next year. 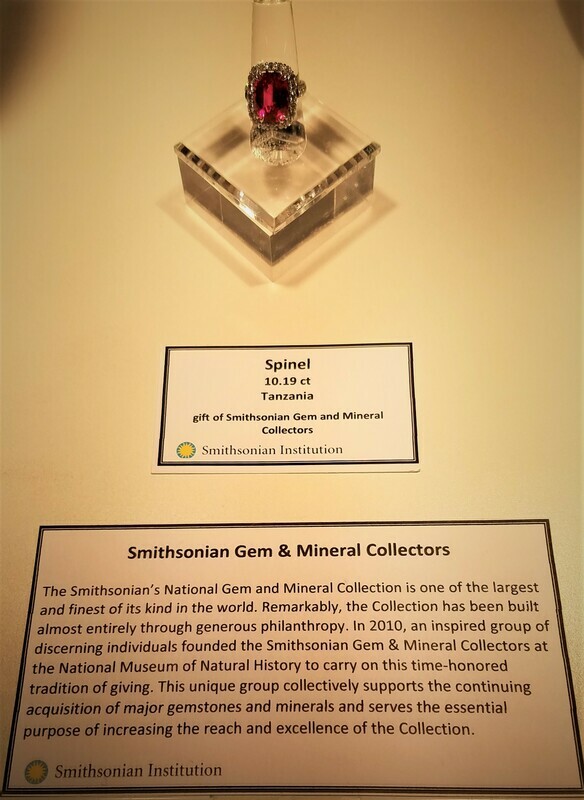 The Smithsonian Natural History Museum always has a set of display cases here at the AGTA, and this year those cases highlighted the Smithsonian Gem and Mineral Collectors -- donations to the museum collections by well-known collectors, many of them who display and sell at this show. 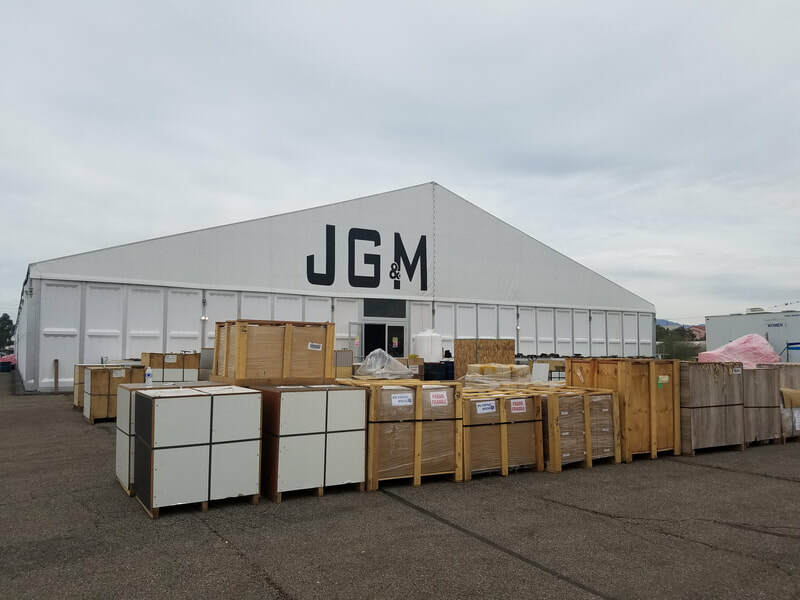 Here we have a show that seems to be struggling -- a tent show on I-10, called the JG&M Expo (the Jewelry, Gem and Mineral Show). 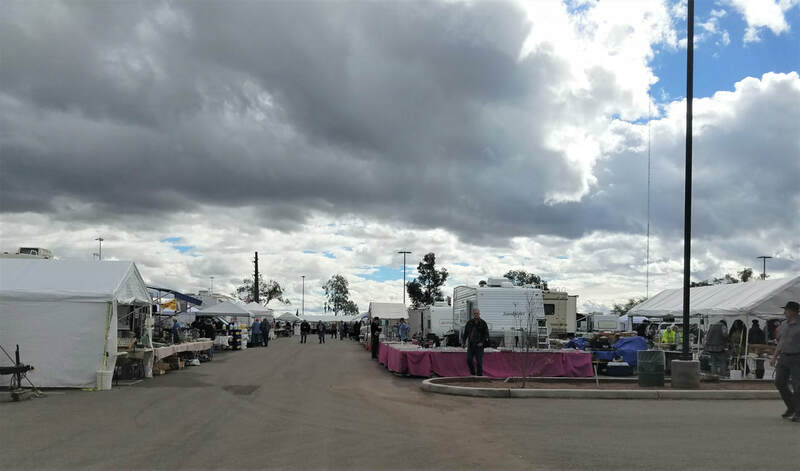 Each year, we see fewer dealers at this show, and some are "spreading out" with large items, presumably to make the tent appear full. 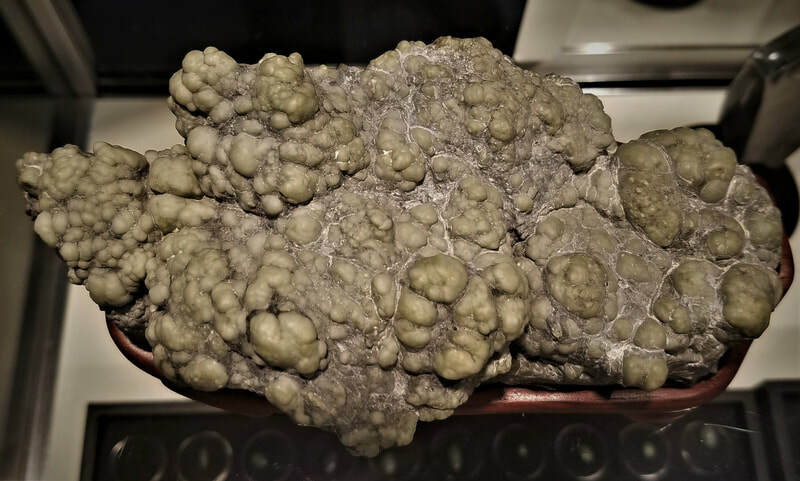 Check out these gigantic selenites from China. ​They will have a second location next year, so maybe the whole show will move there. Wait and see about this one. 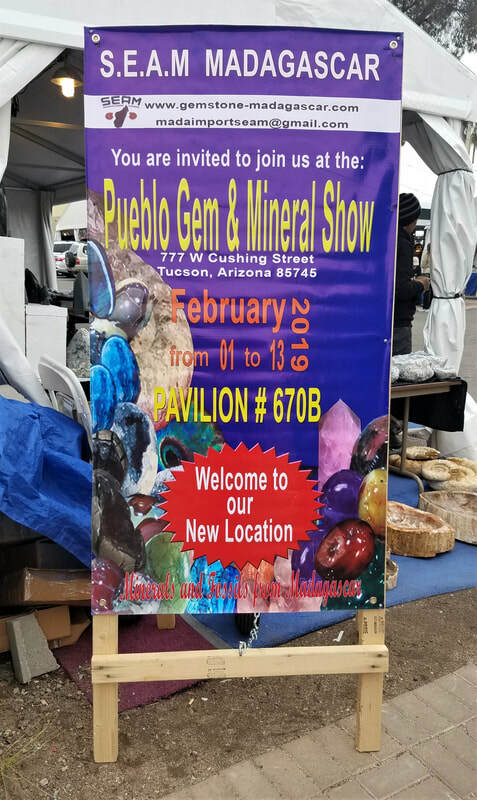 The Pueblo Gem and Mineral Show -- for more than 35 years this show has been one of the busiest gems and mineral showcases in Arizona. 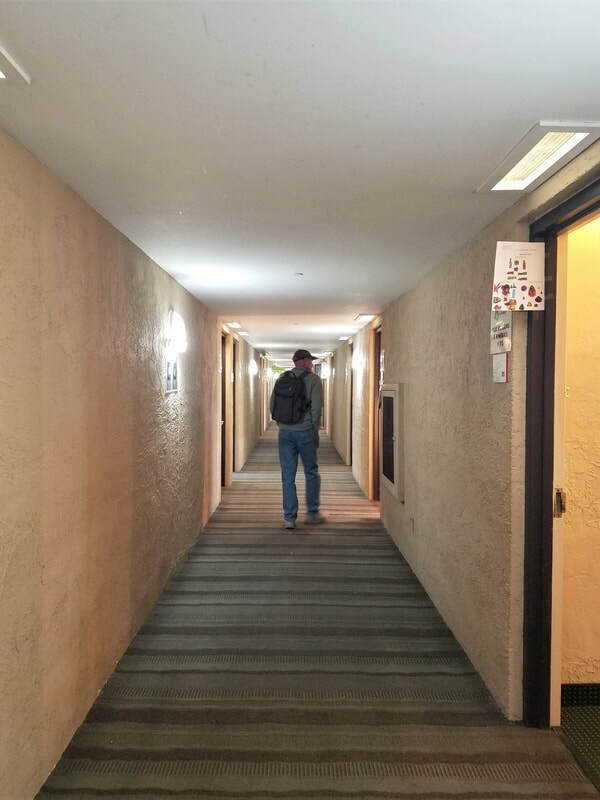 The show runs for 13 days and spreads across several motels lobbies, motel rooms, parking lots, and plazas on the west side of the I-10 freeway. 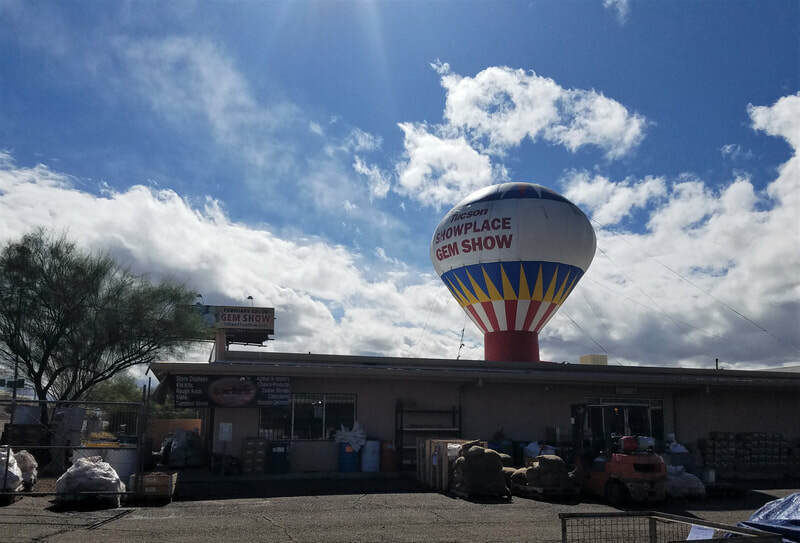 It has been many years since the central motel has been called the Pueblo Inn, but the name stuck to the gem show, even though the motel is now called the Ramada Tucson Conference Center. Parking is abysmal here, but there is ample parking on the other side of the huge freeway with a walking tunnel under the I-10 to visit these crammed shows. 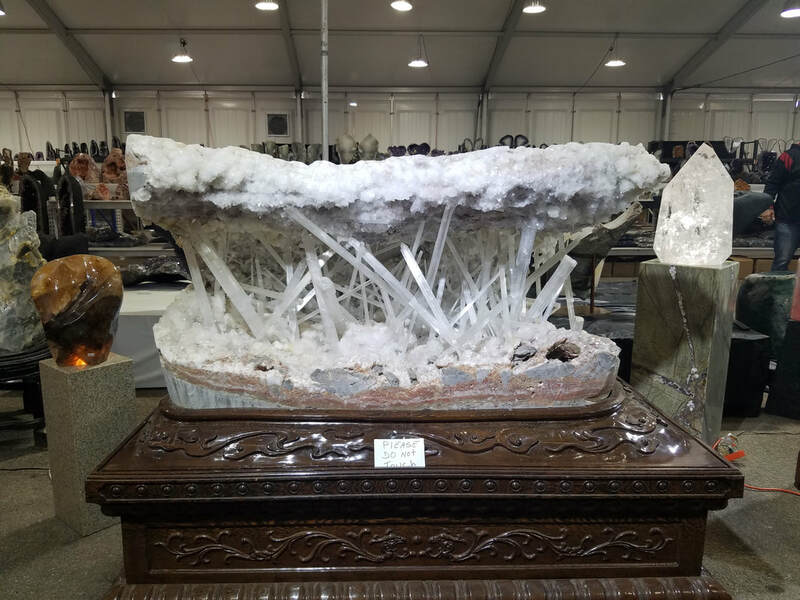 The show truly is a hodgepodge of high-end mineral dealers, lapidary material vendors, fossil sellers, and an unimaginable variety of stones, metaphysical wares, and jewelry. 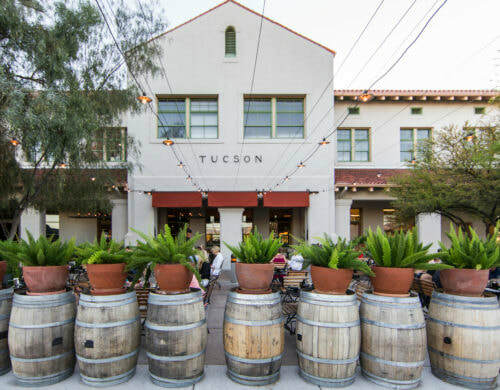 We wouldn't rate this venue highly on the "attractiveness scale," but there are certainly many buyers who list these shows as their primary target once in Tucson, and it is hard to argue with the variety available. 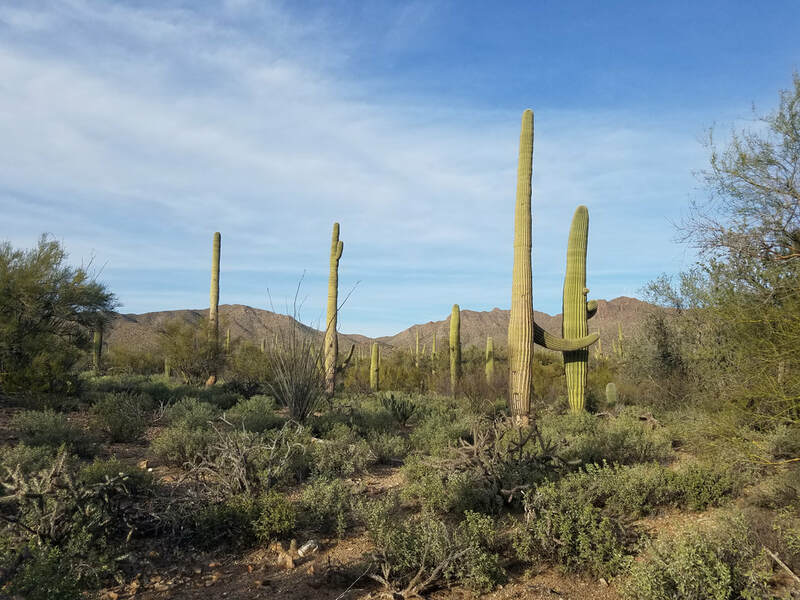 As the shows wind down for us, we took time for a hike among the giant Saguaro cactus in Tucson Mountain Park. These plants live for 150 years, but don't usually grow "arms" until they are 50-70 years old. Spectacular iconic scenery only a few miles west of Tucson! 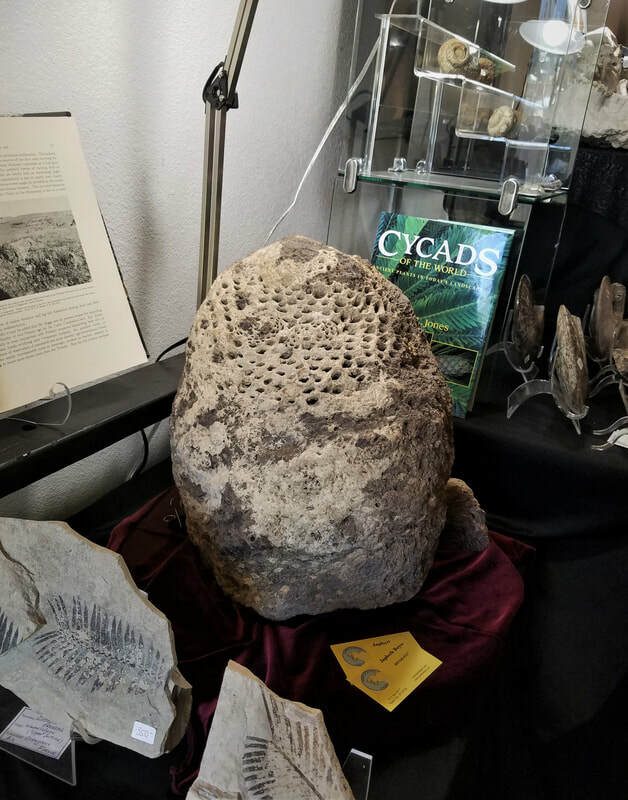 ​One of the enriching experiences we have had in Tucson through the years is the opportunity to attend the annual open lecture sponsored by the American Association of Applied Paleontological Sciences. This year, we were treated to a lecture by Dr. Lance Grande, noted curator at the Field Museum of Natural History in Chicago. 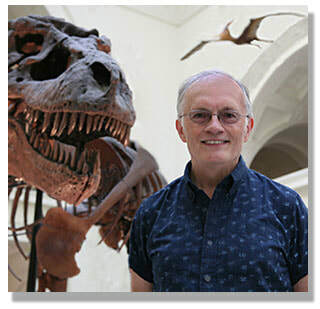 Dr. Grande educated (and amused) us with stories of his life as a curatorial scientist, including his 40 years of work in Wyoming in the Green River Formation, and his long career as curator of the science division of the Field Museum.